Click to view this newsletter. Protein post-translational modifications (PTMs) such as phosphorylation, acetylation, ubiquitination, and SUMOylation, to name but a few, have evolved to diversify the functions of a single protein and account for the vast increase in proteome complexity and functional diversity. A prime example of the complex and dynamic regulatory power PTMs confer is the Wnt/β-catenin signaling pathway. This pathway regulates cellular proliferation, differentiation, and migration during embryonic development and adult cell homeostasis. In addition, dysregulation of Wnt/β-catenin signaling is implicated in multiple pathological conditions, including carcinogenesis and degenerative diseases. In canonical Wnt-mediated signaling, β-catenin is a key effector and interacts, as a co-transcription factor, with the DNA binding proteins TCF (T cell factor) and LEF-1 (lymphoid enhancer factor 1) to activate the transcription of Wnt/β-catenin target genes including cyclin D1, c-jun, and c-myc. 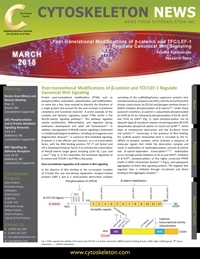 In this newsletter, the functional regulation of β-catenin and TCF/LEF-1 by PTMs is discussed.